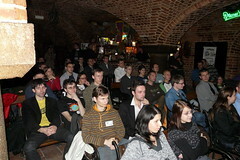 Last Saturday we had a "barcampish" meeting in Torun, the city where we live and work. We have called it devcamp. The basic idea was to gather developers, local companies, enthusiasts, geeks, bloggers etc. Well, and it was a pretty nice success! We were able to get ~70 people to come. Wikidot was one of the organizers of the event, together with another local company, MGA. We have invited a couple of speakers. In fact having Wikidot as our backing-up company was quite helpful, because people instantly recognized us as organizers and it was much much easier to get to the speakers we wanted. Needless to say, using Wikidot.com itself was a good idea too, because we were able to set up a wiki just for the meeting within minutes. You can check this out at devcamp.pl. There are really a lot of such meetings in Poland. They started appearing exactly 2 years ago and now every major city in Poland has its own dev meeting. Barcamp.pl maintains a nice list of them here. We have decided to organize Devcamp in one of the oldest pubs in Torun. Good choice! There were a couple of invited presentations, i.e. 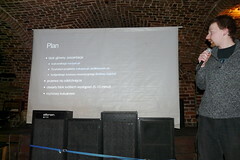 Daniel from CoKupic.pl was talking about social shopping and their project that gathers opinions about various products. From a small garage project they became a part of the Allegro Group. Nice! Sebastian from Socjum.pl was presenting their social website generator, quite popular in Poland. It is similar to Ning.com, but… not quite yet there. However the direction they are heading is good. Krzysztof from DaVinci Capital talked about startups (early stages) from the perspective of an investor. It looks like still the main criterium when deciding which project to invest in is… intuition. Very, very good presentation. One thing he also proved that investors can be cool ;-) I was surprised though that their failure ratio was… 0%. But again, they are not typical VC, rather a group of angels that are interested in seed founding. 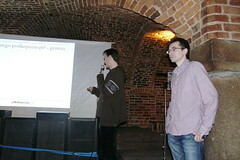 Rafał and Maciej presented their project PodKopcem.pl — aggregator of local events: concerts, exhibitions, parties etc. It is local, it is quite complete, nice interface, quite a strong community — cool! I have started using this some time ago (as a reader only) and it proves pretty useful. What I am missing is a better mobile access to it. Later we had an open elevator pitch block of short talks. Piotr Gabryjeluk was talking about AJAX, Michał Śliwiński (in an awesome way) told us about history of his project Nozbe (one of the best Get Things Done tools out there IMHO) and Arek presented some of the mysterious technologies that MGA is using. 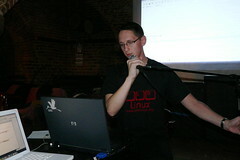 And Przemek Zając demonstrated live how to create a simple blog using Ruby on Rails. Within a few minutes. Impressive! After the meeting we have spent some time moving from one place to another with other people from Torun, Krakow and Warszawa. We ended up in the Desperado pub drinking "Wild dogs" with Sebastian and Krzysztof from Socjum till the very night. The meeting was not without flaws, but imho great. I have met a lot of people, made new contacts and learned a lot. I am pretty sure we will continue with devcamp #2, #3, #4 etc. in about monthly intervals. Thanks to everyone who was involved! And see you next time! I would have loved to here Michael's history of Nozbe as I'm a big fan. 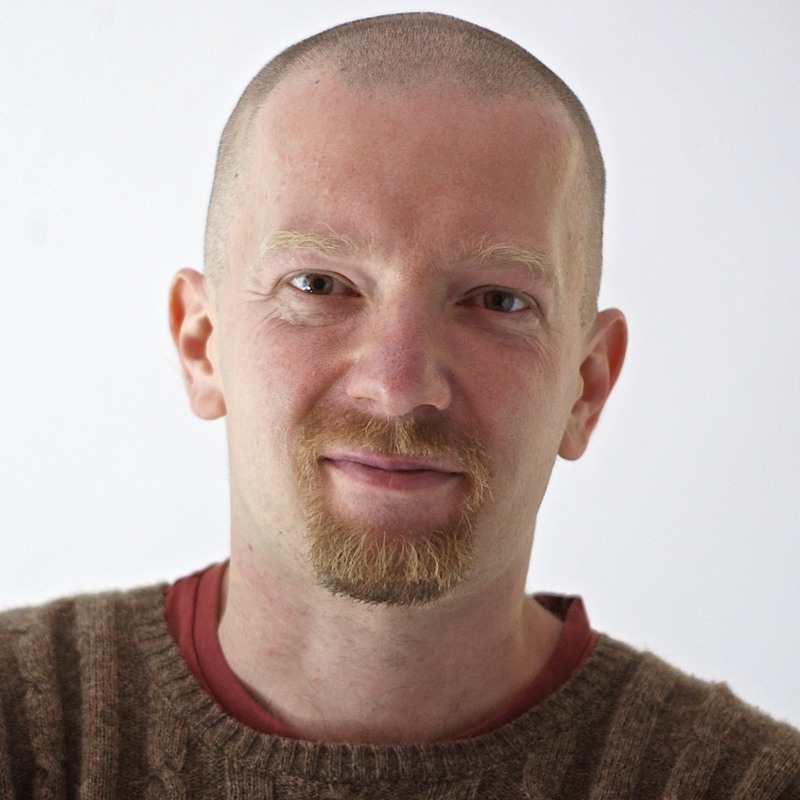 His application has dramatically changed my business and personal productivity for the better, even though I used and taught about time management for many years. Perhaps that should be a project for the future - to have Michael record his Nozbe story in one of his great video tutorials.